Betadine is a germ-killing agent that is used on skin to prevent infection. Often, health care professionals use betadine to clean the skin prior to surgery, to clean wounds, and before giving injections. Once betadine is applied it leaves a yellow pigment on the skin that is difficult to remove, but following these steps should remove the stain. Remove any clothing that is near the area you want to clean. As a precaution, begin by washing hands with warm water and soap. Pour rubbing alcohol solution onto a sterile gauze pad or cotton ball. Rub the alcohol-soaked pad on the skin using a circular motion. Continue rubbing until the yellow color is gone. Use extra gauze pads if need be. Do not get rubbing alcohol in any wound. Let skin air dry. Throw away all used cotton balls, and wash your hands with warm water and soap. Sterile Q-tips may be used instead of gauze pads. Hydrogen peroxide can also be used to remove betadine. Follow the same steps outlined above. 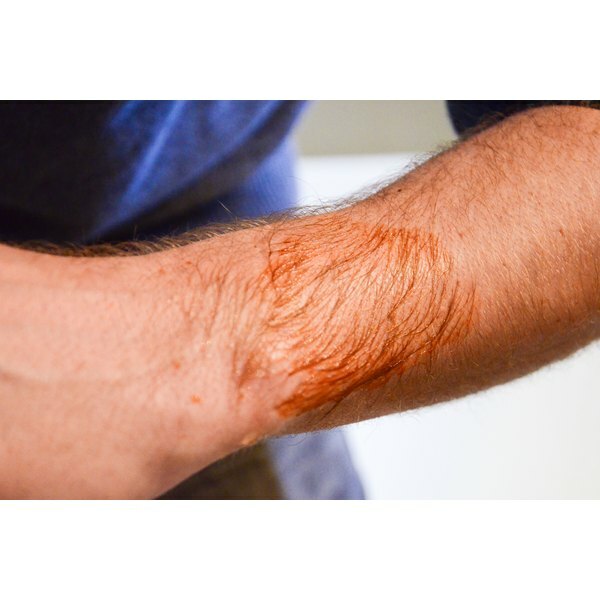 Hydrogen peroxide in a wound will cause stinging. Do not get rubbing alcohol in wound. Do not contaminate alcohol bottle with used gauze or cotton balls. Always check wounds for infection. Signs include red, swollen skin; pus; and blistering. Check with your doctor before removing any wound dressings. Inform your doctor if you are allergic to iodine before using betadine.